Four straight weeks of indecision from the market makes it unwise to become overconfident about what's coming next here (since we are not, after all, smarter than the market). 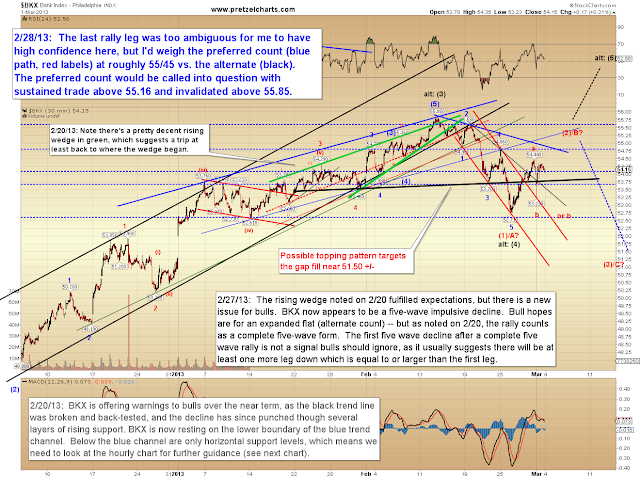 So for this update, I've prepared both bull and bear charts, along with some guide levels to help determine which side is claiming victory going forward. I'm also going to go out on a technical limb with my preferred projections, which I'll cover in a moment. 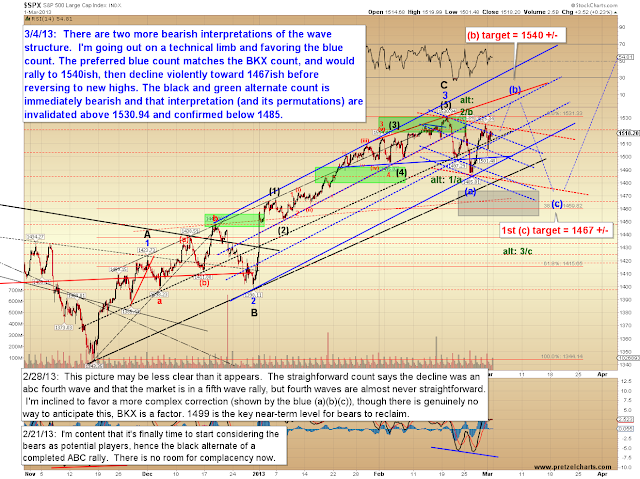 As always, I could very well be wrong -- so I want to note that the blue trend line on the chart above is clearly important to the market, and sustained trade above that trend line would favor the more immediately bullish options. 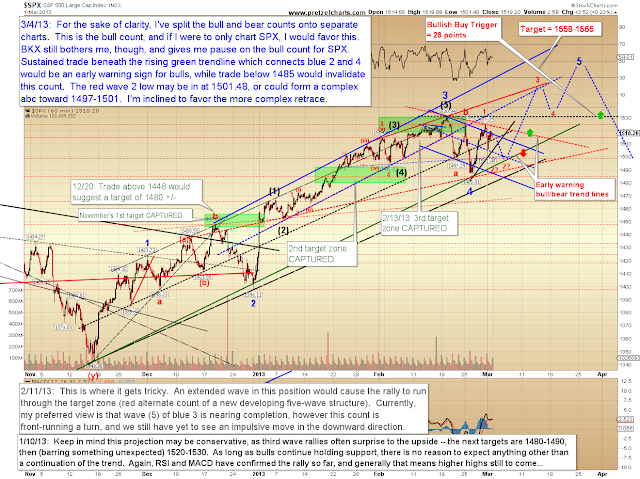 With that warning out of the way, let's cover the options and the levels which will help sort one from the next. 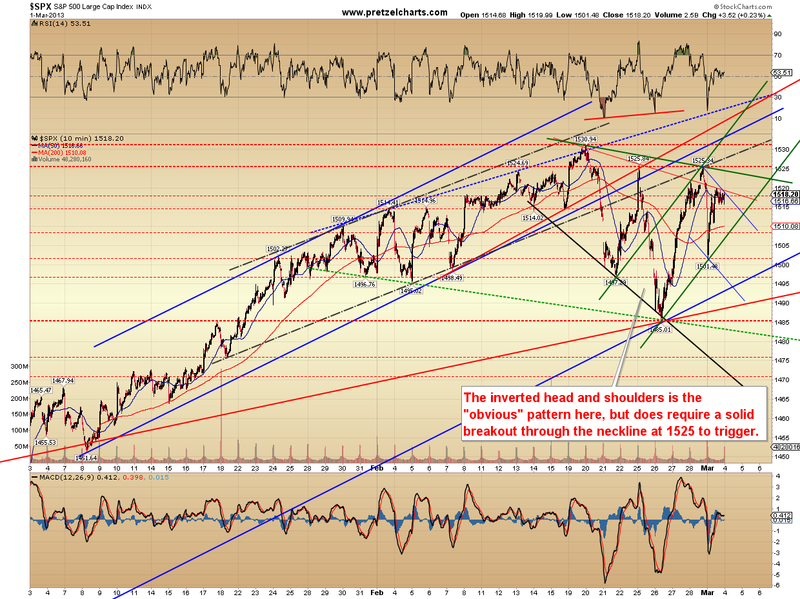 The main chart which is influencing my preferred outlook is the Philadelphia Bank Index (BKX). I'm convinced that the recent decline in BKX was a five-wave impulse, and that means it was either the first wave of corrective move, or the last wave of one. I realize that sounds confusing, but that info will actually help us sort things out going forward. There are two counts shown here, and there's been no change since 2/28 -- in fact, while red wave a exceeded my expectations minimally, wave b found support exactly where projected on the chart in last Thursday's update. I'm never certain if the preferred counts are correct; this is always a game of probabilities -- but we have to start somewhere and build a thesis from there, so I'm presently sticking with the idea that the BKX preferred count is correct. 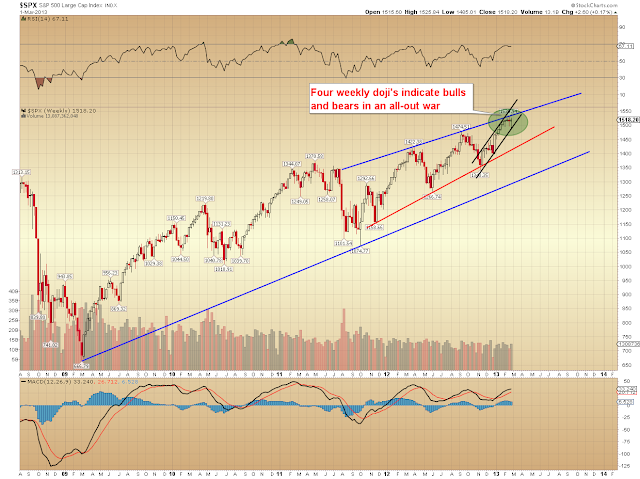 That leads me to look at the S&P 500 (SPX) in a way that allows the two markets to reconcile. 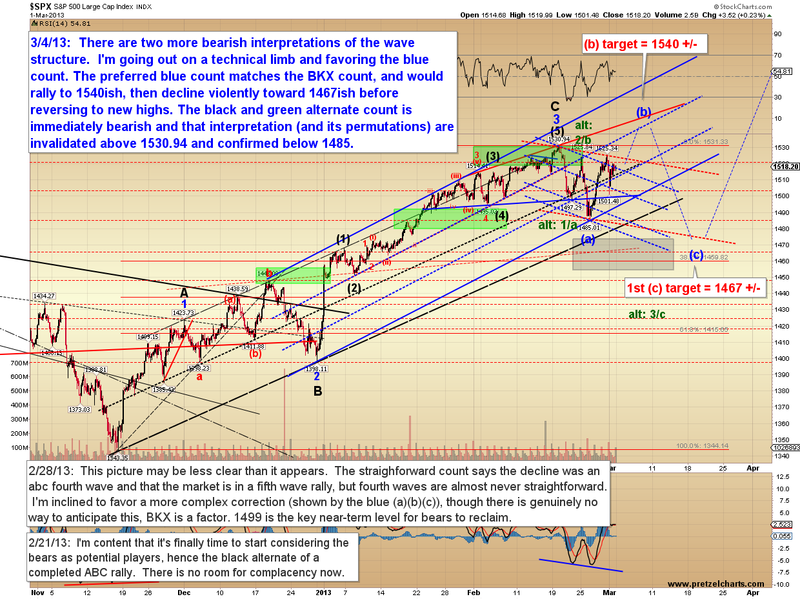 The preferred SPX count, shown in blue below, projects an expanded flat. 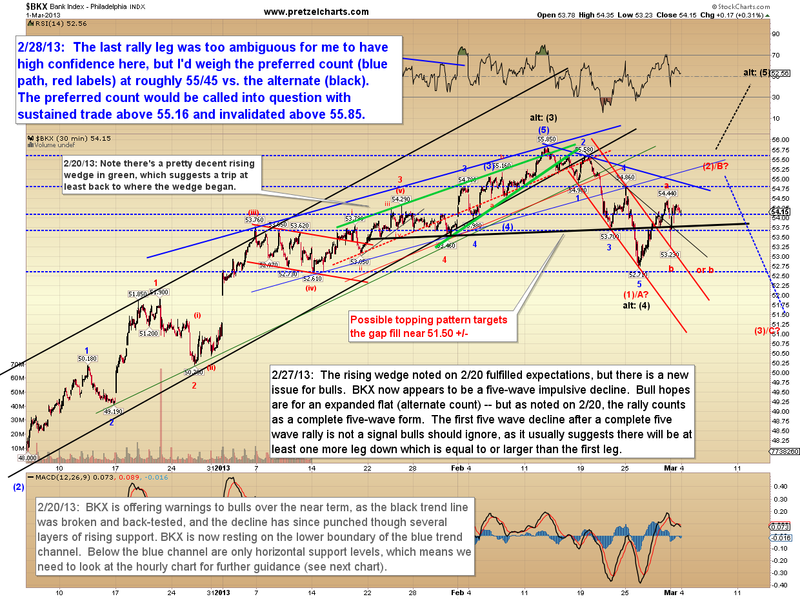 The expanded flat does require another leg up, and the preliminary target is the 1540 zone. 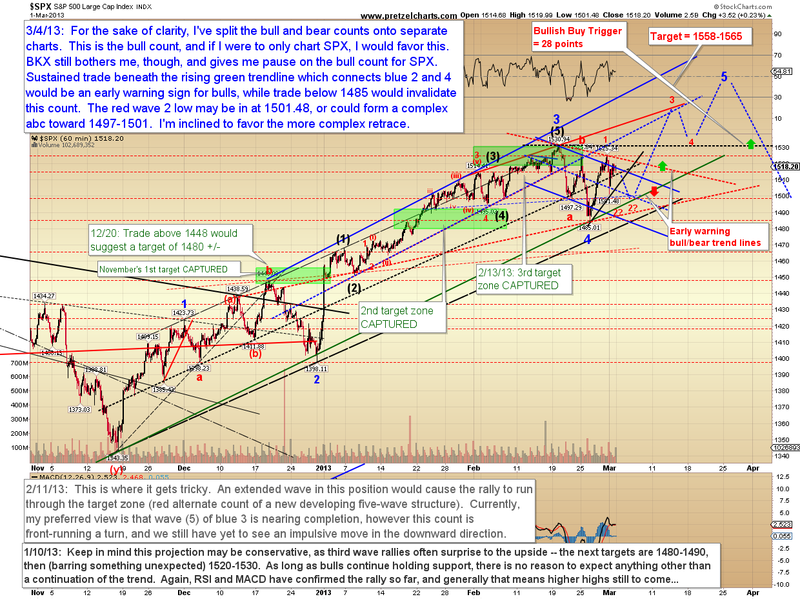 Sustained trade above 1541 would suggest the more bullish count (shown later). 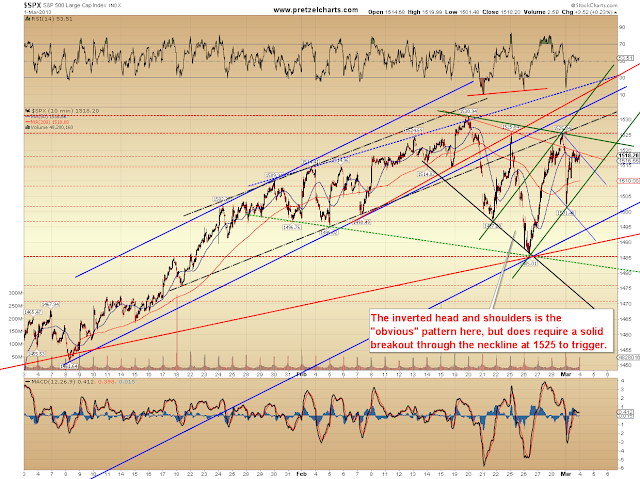 There's an interesting struggle pending if bulls reclaim 1525: the struggle between the short-term pattern and the intermediate-term resistance trend line (refer back to the first chart, upper blue line). The preferred count shown below gives the intermediate resistance level the benefit of the doubt, and suggests the market needs a bit more coiling and confusion before it can build up the potential energy to clear these levels. There is also a more immediately bearish alternate count shown in green; unless/until the bulls push through here, the three-time rejection in the 1525-1530 zone can't be ignored. My preferred outlook of an expanded flat for SPX is really way out on a limb, because the obvious pattern here is the inverted head and shoulders, which, using classic technical analysis, suggests a rally of 40 points on a solid breakout through the neckline at 1525. In conclusion, four straight weeks of indecision from the market makes it unwise to feel too arrogant about the future here. There are times the market is fairly clear, as it was in January and the first part of February, and there are times it isn't. 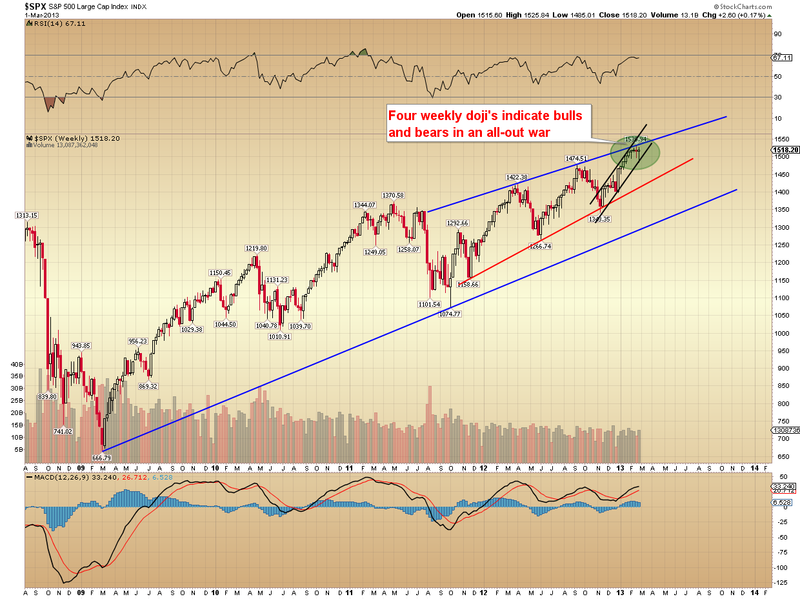 This is one of those times that it's up to the market to declare its next intention. Trade safe.